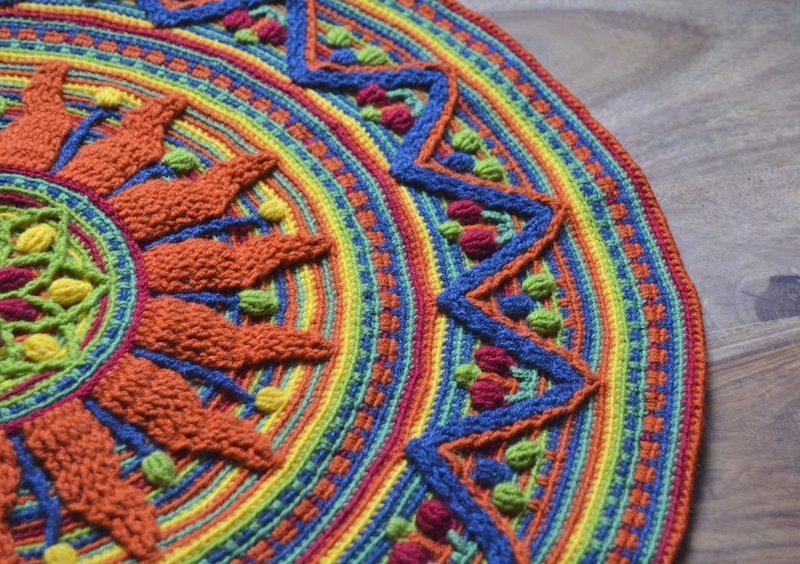 This is my third Sunny mandala and this time I decided to make a rug. Just finished! My hook is still hot :) I used very bright colors for this rug - not really my favourite, but I wanted it to look happy, warm and sunny. I think it can be a very nice rug for meditation. It can also become a bright decoration for a table, or it can even be hung on a wall. But in whatever way it is used it will always be a dominant of any interior. I cannot really explain by words what a pleasure it is to see what other people can make using your patterns. Sonea Delvon was one of the testers of my Sunny mandala. She is a very creative designer, and talented. She actually became my virtual friend. 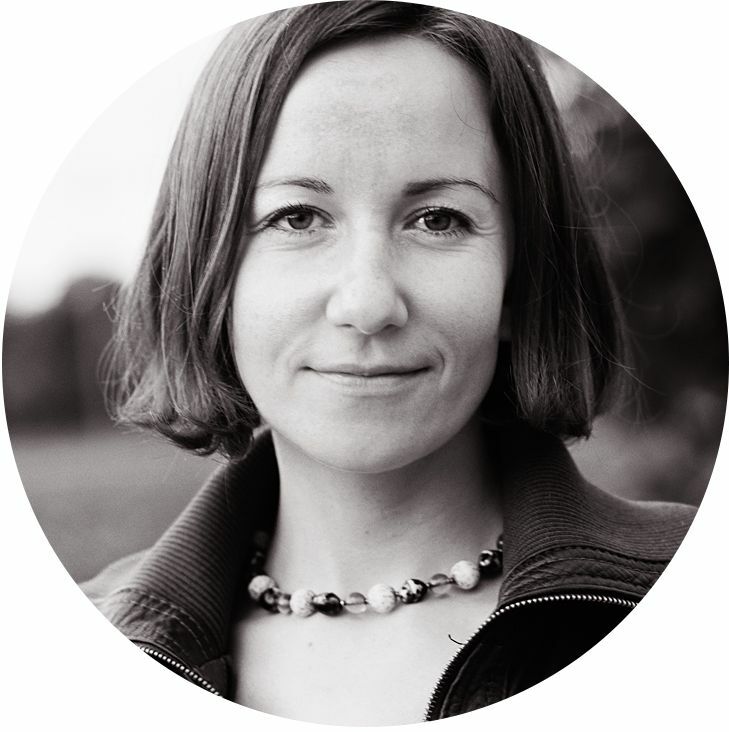 She is the first "professional eye" of my new projects and patterns and I appreciate her opinion very much. She gives me good advice, supports me... and inspires!! 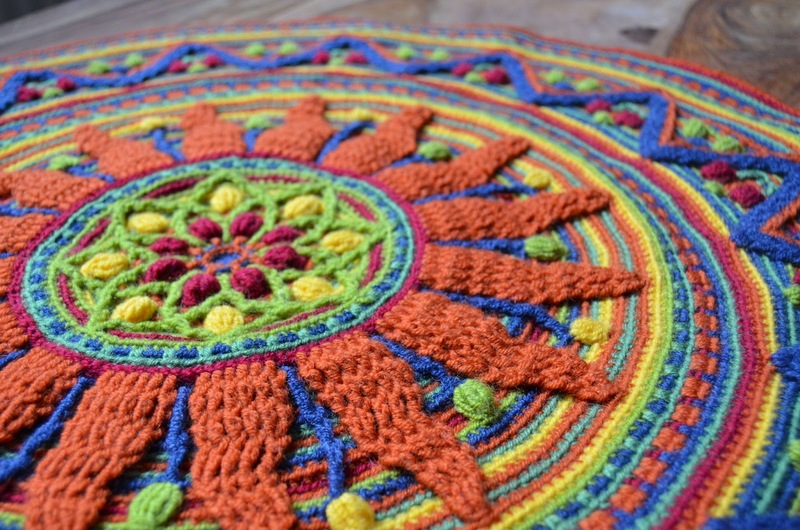 While testing my Sunny mandala she decided to enlarge it and thought of a "zig-zag" motif which made a fantastic edge for a rug. 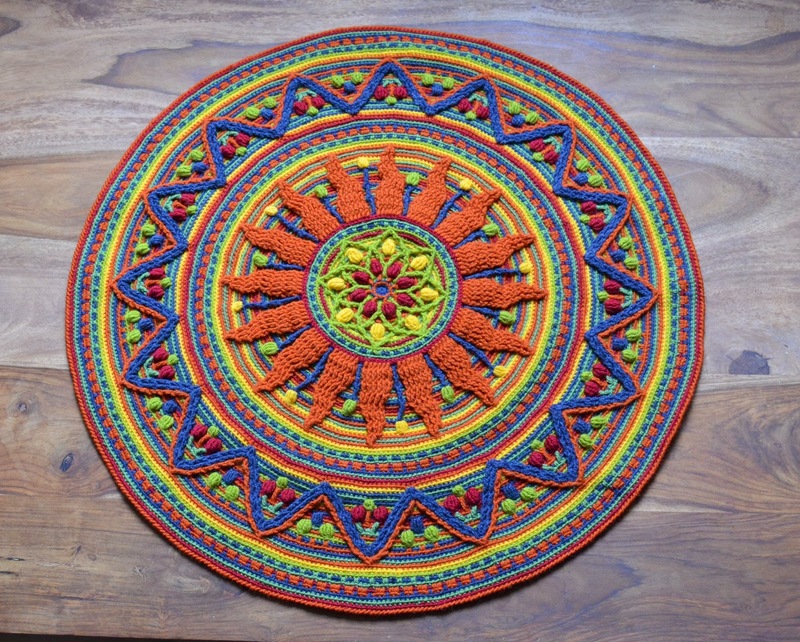 I loved this idea and with Sonea's kind permission used it for my own rug. I modified it a lot, but still the idea is not mine :) Now I feel I want to make even more rugs. Please, check Sonea Delvon's Ravelry shop. You will find many nice patterns. And all of them are completely FREE! 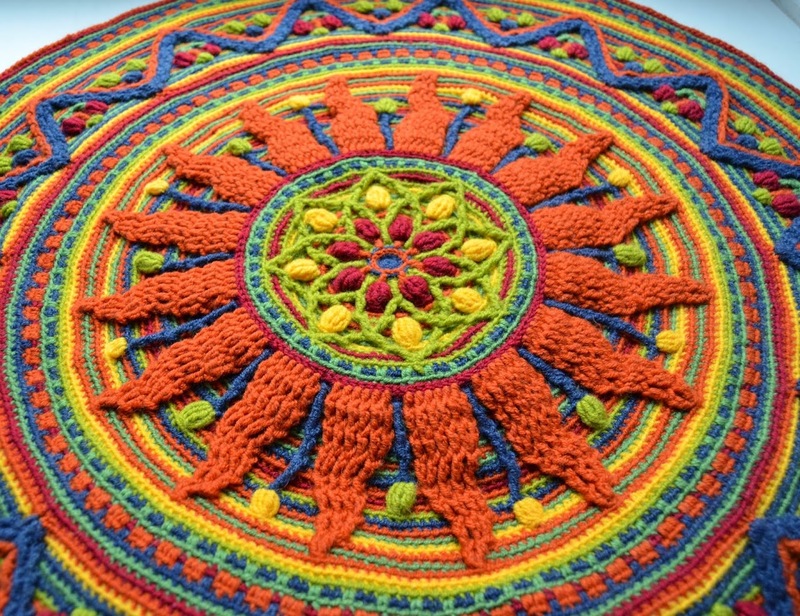 And the pattern for central Sunny mandala is available in my Etsy and Ravelry shops. Where do I find the pattern for this rug? It's magnificent! Have you had the opportunity to write out instructions yet for your Sunny Rug for Meditation yet? I would love to make this but would need the instructions to do so! Thanks for your input! Can i have in french ? Isabelle I am very sorry but at the moment all my patterns are available in English only. I looked on Ravelry for Sonea Devlon's shop - and had no returns. Can you please send a link? Your own work is so awesome! Though I'm 70, when I "grow up" as a crocheter, I hope I can be just a little bit as good as you are! Thank you for sharing all you do. Though I cannot afford to purchase patterns at the moment, I have selected your Dandelion Mandala as a Favorite - and after holidays are over, I hope to purchase it for myself. I just love it! It's one of the most beautiful overlay works I've seen! You are sooo inspiring! thank you again. I was unable to find Sonea's page....is what I'm trying to say. I tried a Ravelry search and got NO results. Just wondering if you have a direct link....is her page, perhaps, under another name? Some prefer to have their page under an assumed - sometimes fun - name. I surely meant nothing to take away from anything you've done! As I said - I could only wish to be as good as you are....I SO admire your work - and want to buy your Dandelion Mandala pattern after the Holidays because I cannot afford to purchase right now...large family means lots of gifts. Just trying to thank you sincerely for showing us your amazing crochet! You ARE so inspiring! Many of us now strive to your level of crochet! Oh, sorry! I thought you are looking for the pattern of this rug, as I got more requests on it in the past but didn't manage to complete it :) Thank you very much!!! I appreciate your words a lot. The reason why you didn't find Sonea's shop is that I misspelled its name... Thank you very much for noticing and telling me. I've added a correct link to the post and now you can see her wonderful patterns :) Thank you once again!